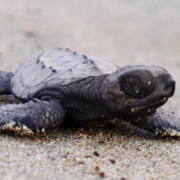 Do not miss your chance to participate in the conservation of Olive Ridley Turtles by helping in the release of newly-born hatchlings into Banderas Bay. You’ll be delighted by these tiny newborn marine reptiles as they scuttle across the sand to the gentle surf. The sight of scores of these teeny turtles starting their lifetime travels will make you smile from ear to ear. Turtle releases are excellent learning opportunities for kids; not only will children interact with the adorable little reptiles, but they will gain a better understanding of wildlife conservation and study. If Finding Nemo is one of your child’s favorite animated stories, they surely were delighted by Crush and his son Squirt, the movie’s sea turtle characters; this is their chance to meet the real thing. After your daughter or son participates in our Puerto Vallarta turtle release activity, she or he may decide that they would like to study marine biology. If you’ve brought along the family to Puerto Vallarta on your vacation, be sure to book one of these family-friendly turtle releases. Visitors to our reptile facility will learn everything there is to know about these endangered marine reptiles including diet, mating habits, anatomy, migration, evolutionary development, natural predators, and aquatic habitat. Participants will learn all about the mounting pressures on the continued survival of these threatened creatures. We are entirely devoted to the preservation of this ancient species. Our herpetological research facility near Puerto Vallarta was founded to raise public awareness about the plight of this delicate species as well as the protection of the American crocodile.